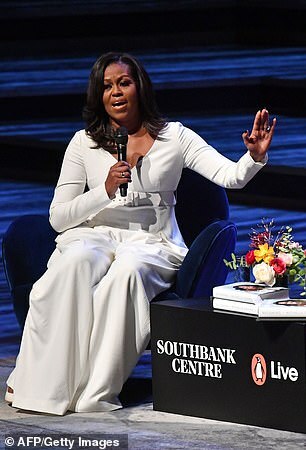 The Duchess of Sussex attended Michelle Obama's talk in London on Monday night, it has been revealed. 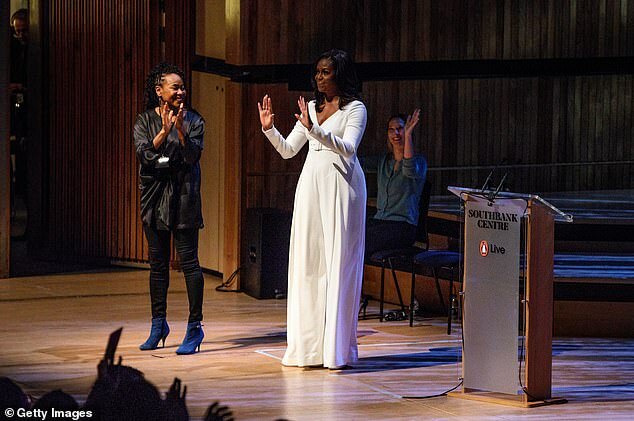 Mother-to-be Meghan, 37, was among the 2,700-strong audience who turned out to watch the former First Lady, 54, discuss her new autobiography with Nigerian novelist Chimamanda Ngozi Adichie at the Southbank Centre. Following the event Meghan met Mrs Obama backstage, in what has been described as a 'power meeting'. 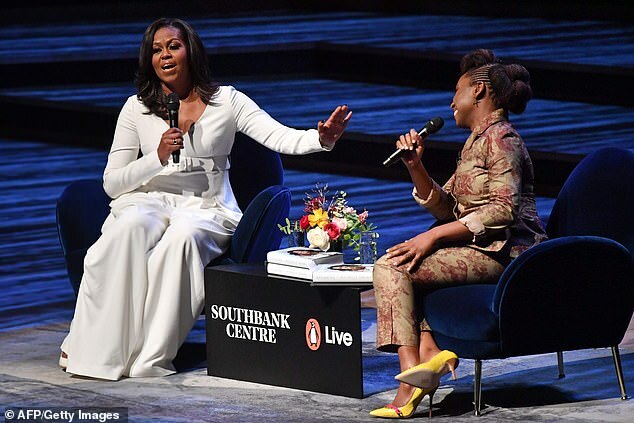 The duchess and Mrs Obama spoke about a range of topics including their shared interest in boosting girls' education, pregnancy and raising children, the Evening Standard reported. The visit was not announced in advance and Kensington Palace confirmed the duchess had attended in a 'private' capacity. 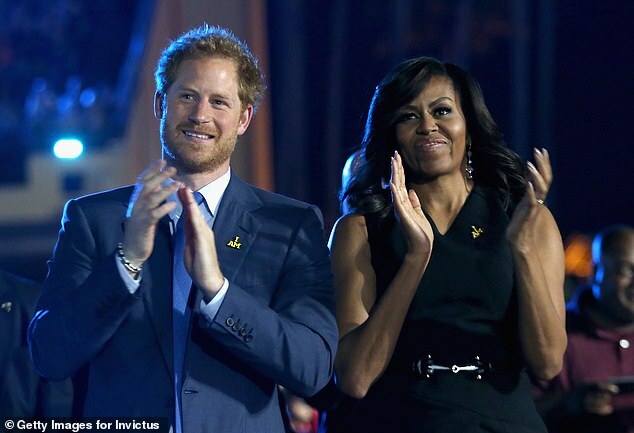 Prince Harry, 34, enjoys a close relationship with both President Barack Obama and Mrs Obama, who has been a firm supporter of his Invictus Games. 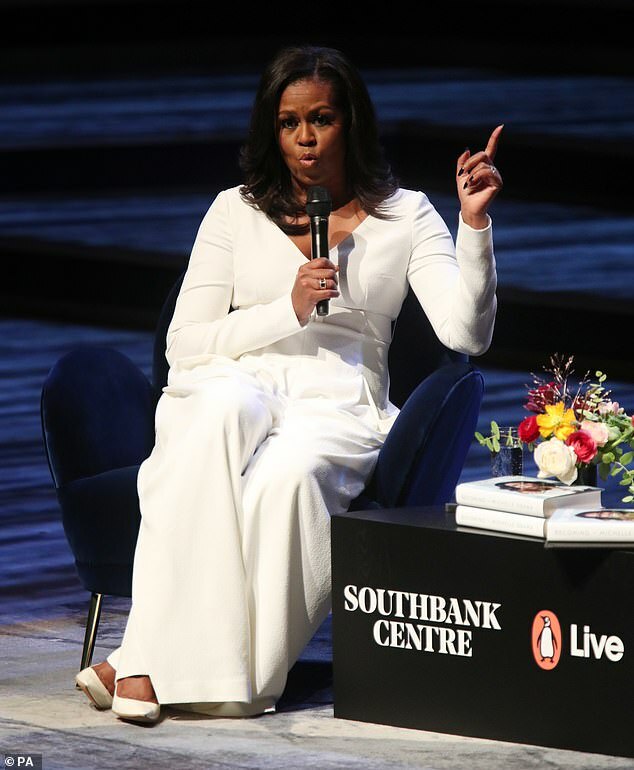 Mrs Obama was in London to speak about her autobiography Becoming at Southbank Centre's Royal Festival Hall. 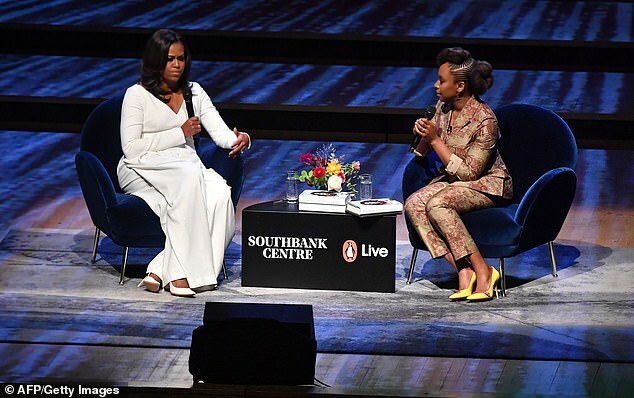 The interview was part of the former First Lady's book tour Becoming: An Evening with Michelle Obama. More than 40,000 people had reportedly tried to get tickets online when the event went on sale, but just 2,700 were lucky enough to attend the event. Those in the audience included actor Riz Ahmed, actress Michaela Coel, Mayor of London Sadiq Khan and 300 school children from secondary schools across the UK. The Duchess of Sussex's attendance was not reported at the time but reports emerged today and have since been confirmed by the palace. Speaking at the event, Mrs Obama also recalled the controversy she caused when she touched the Queen on the back during another visit. Recalling another time she broke protocol, Mrs Obama said: 'This is just how it feels to be at these high levels where people are talking protocol to protocol, that is how these big foreign exchanges are. 'People are talking to other people and then you're briefed and you're told "this is going to happen and don't stand there and don't touch there and this is precisely what is going on". 'This was on our last visit and we went to Windsor Castle and we took Marine One, the helicopter, and we landed in a field and we were going to be driven by the Queen and picked up in the car. 'Our Secret Service doesn't even let me ride around with Malia so up until that point we had never driven in a car driven by anyone else, so it was like 'this is what's going to happen, you're going to get out and sit here and this is what is going to happen'. 'Of course your head is spinning because first of all I'm trying not to fall, which is a major thing that I think about in public. If you're thinking about my thoughts when I come out on stage it's 'don't' fall'. 'One of my primary goals for the eight years was to never become a meme. 'So I had all this protocol buzzing in my head and I was like 'don't trip down the stairs and don't touch anybody, whatever you do' and so the Queen says 'just get in, sit wherever' and she's telling you one thing and you're remembering protocol and she says 'Oh it's all rubbish, just get in'. I'm surprised Princess Meghan's best friend Amal did not go with her. I think Meghan would be surprised to learn Amal is her best friend! Friends yes best friends nope the press just have to make things bigger than they are. .........and she's not a princess. And never will be because she didn't marry the heir to the throne.